Okay, there’s another good thing about not working right now. It’s Monday, it’s raining, and I am in my cozy kitchen with my cup of tea and I just consumed two homemade blueberry muffins (burp). I feel perfectly justified. We busted our butts this weekend preparing for our town’s annual bulk pick-up day. That means we had to haul out of the house all the things that we put aside during the last 364 days saying “trash day” like it was a mantra. Looking for something in the attic and deciding we didn’t need that crib any longer because our youngest is about to turn 21? Trash day! Backyard bench is broken in three places and shouldn’t be available to visitors? Put it behind the shed for trash day! Need to clean out the basement? Trash day! Well, trash day is today, which means we spent the last two months piling up things to bring daughter #2 back to college, welcome daughter #1 back home with all her “stuff,” finding a place for all my “stuff” from my job (good lord we teachers accumulate a lot of crap necessary items for the classroom) and stockpiling all the stuff for trash day. If you’ve ever seen “Gilmore Girls” with Mrs. Kim’s Antique Shop and all the furniture piled everywhere with a tiny path to get through it all, then you’ve seen a much neater version of my living room and dining room. Dressers! Boxes! Bags! Hats! Frames! Stuffed Animals! And books. Oh my word, the amount of books we have in this house is unreal. We all love to read and I think more truthfully we all love to buy books. Now, before trash day, most people hold a garage sale. That’s when we haul all of our trash outdoors, arrange it attractively on the driveway, and hope somebody comes by. Since we live on a main street, we have pretty good drive-by traffic, as evidenced by the sudden jerking-to-a-stop of a normally traveling car and the resulting blare of a horn from the person behind them as said jerky car goggles at our offerings before deciding to park or peel off. We were offering for sale two dressers, two antique (meaning old and gross and dirty and in desperate need of repair) studded-leather wooden chairs, numerous shelves, tools, baskets, kitchen gadgets, jewelry, cookbooks, kid’s books, young adult books (known as YA in the library which always makes me snort). craft books, craft magazines, cooking magazines, board games, puzzles, scarves, a car polisher, a 1960’s record cabinet, a box of hideous plastic/acrylic/squeaky yarn, a coffee maker, a tea maker, several baseball mitts, water pistols, badminton racquets, and a never-been opened faucet set. You can probably surmise that this barely made a dent in our lived-in-for-twenty-four-years home. I am thrilled at the amount we sold, not because we made money but because those things had been in my living room for two months. Once the garage sale is over, the real fun begins. We haul everything that didn’t sell to the curb, go inside to rest our aching muscles, and watch the savvy scavengers move in. Folks from the more citified areas who have this day marked on their calendars just as surely as we do come driving slowly by in their beat-up vans, their seen-better-days station wagons, or their brand-spankin-new SUVs that get about eight miles to the gallon to shop among the piles of unsold merchandise. The first year we lived here we were astonished at this ritual, then realized this symbiotic relationship is probably genius. The folks in the vans usually go for anything that’s made of metal, and they pull out tools to pry everything apart just to get to the metal. They’ll clip the plug on an appliance just to get the copper inside the cord. One year I found somebody trying to smash the shower doors we had put out so he could get the metal surrounding it and I came outside to talk to him. He was halfway back in his van before he understood I didn’t care if he wanted the shower door metal but not to smash the glass because children use this sidewalk as a path to school and couldn’t he just take the whole door? He was flabbergasted that I was encouraging him to take it instead of yell at him, which made me ponder the whole socio-economic theory behind the “I have it easy and you’re struggling but I’d like to help but don’t make a mess.” Not really. I don’t ponder the socio-economic theory of anything. I don’t even like the phrase socio-economic. The SUV-drivers usually take knick-knacks, games, toys, puzzles, scarves, wall art, anything plastic, but never books. This always blows my mind. How do you turn down free books? The next day, we haul out the real trash, like mattresses, rugs, boxes of papers that for some reason were important at some time and are now just mouse nests. I hope you realize I’m referring to things that are in our attic. We don’t leave boxes of papers scattered willy-nilly about our home inviting mice to make a nest among our regular furniture. I’m nice but I’m not that nice. We argue over what’s a keepsake and what’s just ridiculous to hang onto for our children to clean up when we’re gone; we are adept at reading each other’s signals and know when to stop pushing for a particular item and when to agree that it really is trash. We go up and down the attic stairs (which is the third floor of our house) and up and down the front steps and out to the curb and back like a very small army (two) of ants and by the end of the afternoon (when I’ve told Hubby enough is enough and I don’t want him having a heart attack in the attic because the mice would make a nest in him before I could get him down) the curb is piled high with “stuff” and my knees and hips and feet are screaming at me in agony. We sit for a little while to rest, then when it’s time to get up and clean up and make dinner, our legs have locked and refused to move. We shuffle along like Tim Conway calling to Mrs. HuhWiggins and smile sympathetically at each other and revel in a job well done. 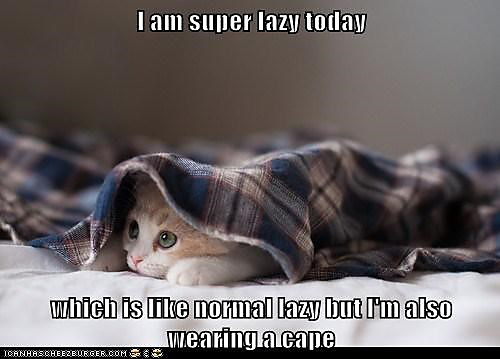 That’s why I’m fully justified in being lazy today. And I realized I forgot to put out the waffle iron and now the garbage truck has already come and gone and I’ll have to store that thing for the next trash day. Only 365 more days!